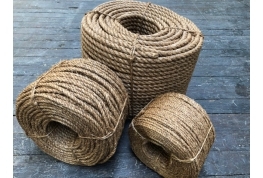 Manila rope is made from fibre extracted from the leaves of the Abaca plant - much of the fibre used to manufacture Manila Rope originates from the Philippines, one of the main producers of Abaca. Manila rope is a very durable, natural fibre rope that can have many uses including, Tug of War ropes, garden decking rope etc. It is important to note that the diameter of Manila Rope will always measure bigger than stated - if drilling holes please purchase your manila rope first and then drill accordingly. Manila rope will shrink and swell when wet.